When the idea of the Women’s March was first presented, I was conflicted about the idea. The cause was fuzzy and seemed scattered. I believe in some, but not all of the stated causes. I wasn’t sure I wanted to take a chance I would be labeled and attached to a cause contrary to my personal views. As the event got closer, things became clearer and though it still didn’t have a single, clear focus, I wasn’t sure I wanted to participate but I supported the idea: we need to take a stand for what we believe in and need to speak for those who for a variety of reasons can’t speak for themselves. Yes, there were too many causes attached to effect rapid change in any one, but the sheer size would get attention, it would be a start. Though we do not all agree on everything, there are some things we do all agree on and our voices are more powerful together than apart. As of Saturday morning, I still had not made the decision to go. Honestly, I wasn’t sure I wanted to take the time. Home was comfortable. If I were to go, I would be going alone as everyone that I knew were heading into the city had already left and I thought it unlikely I would be able to meet up with anyone in a sea of thousands. I spent a couple hours pondering, but couldn’t shake the feeling that this was something I NEEDED to do. After all, the day before, our president took steps that may lead to many vulnerable people losing life-saving health insurance. These include the poor, the disabled, those with pre-existing conditions such as auto-immune disorders, autism, asthma, and mental health issues (all of which in the past have been a cause for denying health insurance completely). There are indications that there are plans to move quickly to make more changes, many of which I feel will be harmful, especially to the disabled and to our environment (which will affect us all). Many are arguing that I am being alarmist, that the worst won’t happen, but if I have learned anything in the past year, it is that anything can happen; there are no assurances, there is no longer a status quo when it comes to the U.S. government. I also know that rights are much easier taken away than restored. We cannot be complacent and take a “wait and see” approach with the lives of our most vulnerable citizens at stake. In Philadelphia, the crowds were polite and attentive to the speakers onstage. Mayor Jim Kenney was the first to speak. 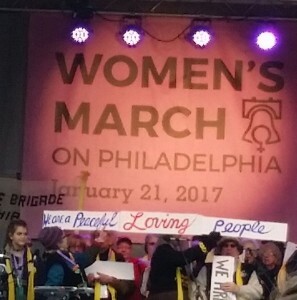 He affirmed his support for women, and encouraged the crowd to do more than simply show up at a rally, telling people to find a cause they believe in and “go volunteer somewhere.” Donna Bullock, a state representative from Philadelphia, was insistent that “we must continue to listen to each other” that working together and learning from each other is important. Overall, the message of the day was a positive one: we need to stand together and watch out for each other. We need to be aware citizens and make sure our elected representatives know where we stand on issues. On Saturday evening, I saw coverage of the many marches throughout the world, both on TV and on Facebook. I was hurt and baffled, then angry that so many misunderstood the point of the day’s gatherings. Friends made angry accusations, saying things like “Get over it, Trump won. Just move on” and stated that the marches were a waste of time, with the assumption that the point of the protest was to unseat Trump. Others condemned the demonstrations as pro-abortion rallies. Some talked about violence and destruction (there was no report of this at any event on Saturday). None of these things are true. I couldn’t understand why so many chose to make assumptions, rather than ask a question or do a little research. I spent much time thinking about the responses I saw and I wondered how many people were really considering what Jesus would do. I thought of His words, “Whatsoever you do for the least of my brothers, that you do unto me.” If we turn our backs on the disabled, the poor, the mentally ill, what does that say about us? We cannot just turn a blind eye to policies that dismantle programs that provide assistance. As Christians, we are called to spread His word, not to sit by and watch as others’ rights are eroded. In last week’s gospel, Matthew told us the story of Jesus calling His disciples to follow Him. In the homily, our priest expanded on that, talking about how extraordinary it was that Jesus called fishermen to come join him in his mission. He could have chosen “experts” in areas such as finance, business and law, but instead he chose men with no experience in public speaking, calling them to be “fishers of men.” We were reminded that there are no special qualifications needed to follow Christ, we need only to look to His example and take action to make a difference in the world. A central moral measure of any budget proposal is how it affects the lives and dignity of “the least of these” (Matthew 25). The needs of those who are hungry and homeless, without work or in poverty should come first. I argue that given these tenets, we are obligated to speak up. It is our responsibility as citizens to hold our elected representatives accountable. As Catholics, we need to stand up for what is right, to speak up when we see injustice, to do what we can to right wrongs. There is no place for complacency. The message I heard over and over again on Saturday is that as mothers, sisters, daughters, it is up to us to watch over each other. Traditionally, we are the caretakers. It is our responsibility to speak up and be heard. Next > What Would Our Revolutionary War Veterans Think? I am so glad to read this post! I have friends who have said stuff like “get over it” and “I don’t understand what all the fuss is about.” They can’t see past their own circumstances to understand that while they might have all the freedoms and choices they want, not everyone does, as you pointed out, the disabled, poor, and mentally ill. Jesus didn’t teach us to turn our backs on these people. I am very concerned about the direction things are heading. I don’t speak or write much about politics, but I do read and watch. I think part of the problems we are having now is that we have become so isolated that we don’t always see how we are alike. I’m hopeful that things will turn around.